Official Department of Defense manuals are U.S. Government documents, so they cannot be copyrighted. It's just a matter of finding them. There are some nice collections on line, but you can also find them yourself (and find manuals not included in someone else's collection) with some simple Google searches. The 90th Infantry Division Preservation Group has a great collection of manuals! 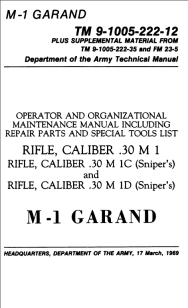 "Operator and Organizational Maintenance Manual Including Repair Parts and Special Tools List / Rifle, Caliber .30 M1 / Rifle, Caliber .30 M1C (Sniper's) / Rifle, Caliber .30 M1D (Sniper's) / M-1 Garand"
"U.S. Rifle Caliber .30, M1"
Book: How to Shoot the U.S. Army Rifle, companion to the above film. Book: SMALL ARMS INSTRUCTOR'S MANUAL, An Intensive Course, including 1917 Enfield, 1903 Springfield, 1898 Krag, M1911 pistol, revolvers, etc., compiled by the Small Arms Instruction Corps, 1918. UNITED STATES RIFLES AND MACHINE GUNS, Fred Colvin and Ethan Viall, 1917. Nicolaus Associates sells a large collection of reprints of manuals, diagrams, and more, some of them the result of meticulous restoration. ODCMP Coaching Resources page has lots of very useful target shooting information, including tips from the U.S. Army Service Rifle Team and much more.